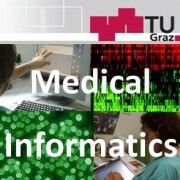 This course covers computer science aspects of biomedical informatics (medical informatics, health informatics, bioinformatics). The focus is on knowledge extraction and discovery from complex data by applied machine learning and concentrating on algorithmic and methodological issues of data science. Note: Sample exam questions with solutions can be found in the Springer textbook available at the Library: Andreas Holzinger (2014). 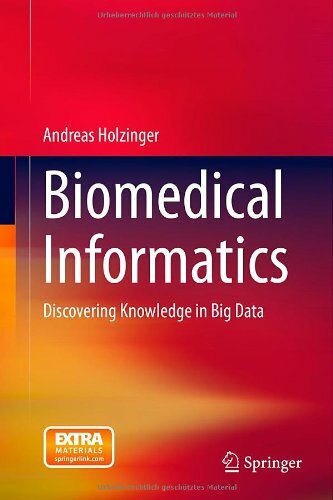 Biomedical Informatics: Discovering Knowledge in Big Data, New York: Springer. DOI: 10.1007/978-3-319-04528-3 – however, please always check the latest course material for new stuff. This course is compulsory for bachelor students of Biomedical Engineering (5th semester), and elective for master students Biomedical Engineering, but also recommendable for Telematics (Subject area catalog: Medical Informatics, Bioinformatics, and Neuroinformatics), Informatics and Software Development. 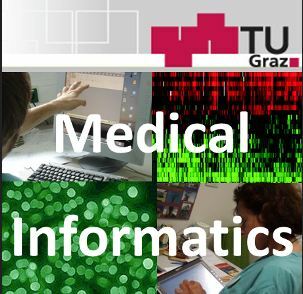 The complete course is presented in English as it is part of the Doctoral School Informatics – so PhD students and international students are very welcome! 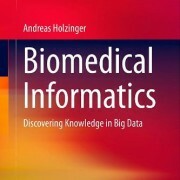 Definition: Biomedical Informatics (more generally called Health Informatics, HI) can be defined as an interdisciplinary field that studies and pursues the effective use of biomedical data, information and knowledge for problem solving and decision making, motivated by efforts to improve human health and well-being. Consequently, this course is focusing on data, information and knowledge in the context of biomedicine, life sciences, health and well-being. The lectures follow a research-based teaching (RBT) style, showing the students state-of-the-art science and engineering, and discussing some underlying fundamentals and basic principles of this extremely important, challenging and future oriented field: towards the approach of personalized, molecular medicine, smart health and on how sophisticated machine learning algorithms and knowledge discovery methods can help. A grand goal of future medicine is in modelling the complexity of patients to tailor medical decisions, health practices and therapies to the indiviudal patient. This trend towards personalized medicine produces unprecedented amounts of data, see A. Holzinger, “Trends in Interactive Knowledge Discovery for Personalized Medicine: Cognitive Science meets Machine Learning“, IEEE Intelligent Informatics Bulletin, vol. 15, iss. 1, pp. 6-14, 2014. This course will foster an integrated approach: for the successful application of machine learning algorithms in health, a comprehensive and overarching overview of the data science ecosystem and knowledge extraction and discovery pipeline is essential. This means that a multidisciplinary skill set is required, cross-domain, encompassing the following seven specialisations: 1) data science, 2) machine learning algorithms, 3) network science, 4) graphs/topology, 5) time/entropy, 6) data visualization and visual analytics, and last but not least 7) privacy, data protection, safetey and security. See the HCI-KDD approach. Always remember: Science is to test crazy ideas – Engineering is to put these ideas into Business! LV 709.049 Schedule Winter Term 2016/17, NOTE: The slides get updated right after each lecture! Please NOTE: Each year this course will be updated. Old lecture slides from last year can be found below, however, for the next exam only the most recent one are relevant. The life sciences, biomedicine and health are increasingly turning into a data science, where we face not only increased volumes and a diversity of highly complex, multi-dimensional and often weakly-structured and noisy data, but also the growing need for integrative machine learning approaches. Automatic Machine Learning (aML) can be of great help here, particularly when having big data sets – where algorithms can learn from it. However, sometimes we deal not with big data, but with complex data, rare events or even NP-hard problems, e.g. in subspace clustering, protein folding, or k-Anoynmization, where such aML-approaches fail or at least carries the danger of modelling artefacts. In such situations it is benefical to make use of interactive Machine Learning (iML) by putting the doctor-into-the-loop of the machine learning algorithms.